Voith's portfolio spans renewable energy, oil & gas, paper, raw materials and transport. With over 40,000 employees and locations in over 50 countries of the world, it is one of the largest family-owned companies in Europe. Voith Hydro is a subsidiary of the Voith Group, and is a leading supplier of hydropower equipment and services, having manufactured around a third of all hydroelectric turbines and generators. Voith's 1MW horizontal axis turbine HyTide 1000 has a rotor diameter of 13m and weighs 200 tonnes. Preparatory works commenced in summer 2011 with a 23m monopile installed in the seabed at EMEC’s tidal test site at the Fall of Warness off the northern island of Eday. The turbine was installed in September 2013 and subsequently removed in February 2015. 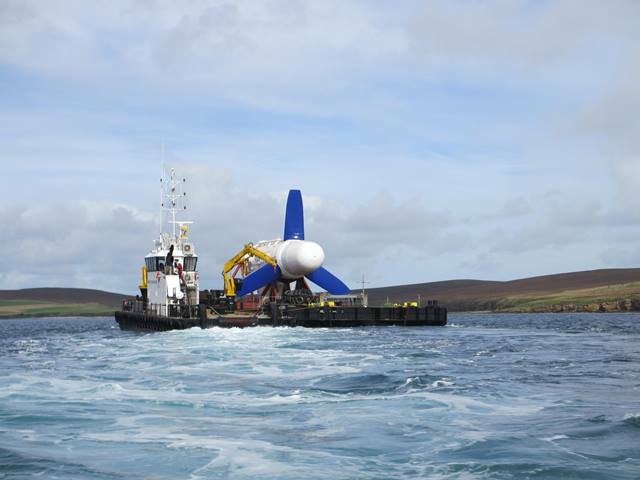 The device was installed at European Marine Energy Centre (EMEC) tidal device test area in Fall of Warness, Orkney. South Seal Skerry (West Coast of Eday) Orkney. Water Depth: 33m. Tidal range: 3m. Tidal speeds up to 3.7 m/s. The Voith HyTide turbine was removed in February 2015 after around a year of operation in which multiple lessons on technical and environmental considerations were learnt. Since Hytide’s removal Voith have not attempted to progress the tidal stream arm of the business, stating that technologies developed for marine could now be used in river systems and for installations in existing locks and dams. In 2016 Voith assets in the form of a monopole and scientific monitoring equipment were transferred to SME to support deployment of their PLAT-O#1 device, also at EMEC. Baseline studies for the Fall of Warness test site were performed by EMEC and can be found here. Voith HyTide at EMEC is located in United Kingdom. Benthic survey to determine the baseline benthic environment. A ROV survey was undertaken to collect video footage of the seabed in the vicinity of the proposed installation site. The results of the seabed survey indicated that the seabed was predominately composed of heavily scoured bedrock slabs with areas of boulders. No distinct patches of sand, gravel or fine sediment were observed. This type of high-energy environment severely restricts the development of benthic communities and only occasional small kelp plants, encrusting algae and barnacles were clearly observed on the bedrock surfaces exposed to the tidal current. There was, however evidence of cryptic communities existing in crevices, under overhangs, and around areas of boulders. A number of urchins, whelks and other molluscs, and small sponges appeared to be present; however, a detailed assessment of the species present in these areas was not possible from the ROV footage. Monitoring of interactions with the device. Data from 3 video cameras mounted on the device over a period of ~3 months. There is one potential siting of a seal from the video footage, however this is unconfirmed. Footage shows one diving bird in the vicinity of the turbine. Fish and jellyfish can be seen to aggregate around the device, particularly around slack tide. Monitoring of the extent of biofouling on the device. A time lapse video is available which shows distinct progressive fouling of the nacelle. Growth begins within weeks of the turbine being in the water. Biofouling is patchy at first but coverage increases with time until most of the visible nacelle is covered in growth. This becomes darker with time suggesting an increasing density of fouling. Observational monitoring at seal haul-outs during the breeding season. Extensive monitoring carried out pre deployment as part of EMEC monitoring procedures. During operation for 1 hour 45 minute periods twice a day between 22nd May and 29th September 2013. The presence of pups at all sites during 2013, and the observation of a live birth at Swenstay point on 22nd June suggests the absence of pups at some sites in previous years is more likely a result of inter-annual variation between the three sites. Overall, the number of seals observed in 2013 was less than that reported in 2011 when there were several times during which 40 seals were present. The highest number of seals observed at any of the haul-out sites in 2013 was 27. Such a trend was mentioned by the observer, who suggested that numbers of harbour seals in the area have fallen over the past few years. The presence of work boats, DP vessels and RIBs in the development area does not appear to cause disturbance to seals hauled out at Seal Skerry. The same conclusion was drawn by the observer who recorded no change in the behaviour of seals whilst the DP vessel and work boats were on site. Disturbance events were however recorded, but were confined to times when RIBs travelled in close proximity to haul-out sites. Such events resulted in the seals being classed as either ‘alert’ or ‘disturbed’.